Will Apple's New iPhone App Forever Change The Universal Remote As We Know It??? 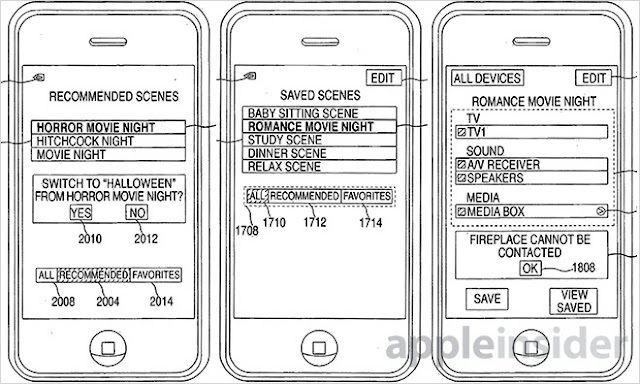 Apple’s new iPhone patent application could signal turning your iPhone into a universal remote so powerful, it doesn’t just recommend TV shows—it controls your entire home. This new Apple patent was the brainchild of the same developer, Alan Cannistraro, who developed the first iTunes Remote IOS. That’s a good track record to build upon in terms of remote mastery. Not only does this planned app connect easily to multiple media components with Wi-Fi capability—it also will connect to other “smart home” components like lights, window shades, or thermostat. There just needs to be some type of wireless protocol. Does What Regular Universal Remotes Can't. A normal universal remote is happy to do what you command—switch a station, get some info, increase the volume. The new app means your remote can actually store and analyze your choices over time to recommend selections based on things like time of day, genre, or even day of the week. Also, a regular universal remote requires you to set up components in the system, whereas the new iPhone app allows the phone to communicate with those devices and incorporate them into the app. Isn’t wireless wonderful? Receives And Stores Settings From Multiple Smart Components. The new app doesn’t just receive or store settings from media devices. It can receive and store info from many separate components and understand the operational parameters of each one. So that volume or lighting level can be measured and stored for later recall. Supports Hardware And Software Settings. The new smartphone super-remote app doesn’t just recall levels and selections. It also remembers what hardware and software was in use—and their settings, too. So multiple screens, platforms, and playback formats are all easily recalled, eliminating those long arduous attempts to find something or re-create a playback situation. It probably seems like an afterthought, but all the stored scenarios with this new app are customizable. So you don’t have to watch a movie with the lights off, just because you did the last time. A Robust Recommendation Engine In A Remote. Your usage patterns and the metadata associated with them are detected by this remote—then used to offer recommendations that associate time of day, genre, frequency of viewing, era of production, and a variety of other factors. Thus, your Apple iPhone app ultimate universal remote (when it one day arrives) just happens to be an incredible recommendation engine, too. Here’s one that’ll blow you away. Say, for example, you’re watching a sitcom in the kitchen and someone else is watching a ballgame in the living room. Because your remote controls multiple devices, it works with both TVs. AND, since your phone is location-aware at all times, when you move from one room to another, your remote senses this and allows you to now control the device in the room you’re standing in. Remotely specific. A unique concept. And Now, A Word From Your EPG During A Word From Our Sponsor. All those great recommendations your app-powered iPhone will be sending your way? Well, this remote actually waits till a commercial is on to recommend them. That’s right. The app senses when commercials are on, and uses that time to inform you of other viewing opportunities without disturbing your current viewing. And, making good use of the downtime during that commercial announcement. Of course, it’s just a patent right now, but considering the background of the developer, ease of connectivity, multiple platform and device interactivity, customization potential, recommendation power, and location sensitivity? Better tell your regular universal remote to look out. The ultimate universal product-controlling iPhone remote might not be far away. Not really. Im purely an Apple “user” but I follow tech on all brands so nothing they showed us is something that I haven’t seen before. So when I see the new photo organization, multiple weather summaries, animated backgrounds, improved notifications or quick access to key settings then Im happy I can finally do it on an Apple product. But nothing there really is enough to say Apple is back to being innovators.